I was thinking about possibly taking a year off. Last year was my best year growing but the pepper maggots turned me off so much that I lost interest and left way too many peppers on the plants. I can't let this happen again. All this talk about the Sri Lanka Chili Red in the growdown for this season has gotten me pumped up. I started looking at the ole seed collection and have come up with the start of a plan. I gotta get those Sri Lankan Reds planted so here is my first group of peppers that I will plant. Starting with all Chinense and of course a few cells for the Sri Lankas. Using the same Parks BioDome's that I have used successfully in the past. 60 cells in a 10 row by 6 layout. I split it down the middle and do 10 rows of 3 cells per pepper. I am going to start with the "weird" stuff and some old stuff. White Bullet Habanero (Juanitos) I love these! This is just a start. Lots more to go. Wow. I'm sweating just looking at that list, Ben! Glad to see you on the forum this season, Amigo. Somehow out of topic: I wonder how do you spell that Boze Moj from Rainbow Chilli Seeds Translation from Serbian to English is My God. English would sound like Boje Moy, where J is like J from Jardin in French,and moy sounds exactly when you say boy. Just like a pepper named Lanterna De Foc, which is pure Romanian language, even if most vendors say is a Kosovo pepper. Lanterna means mostly Flashlight, and De Foc means OF Fire. Good luck for 2019 Ben. molasses insect trap... I saw that this morning, maybe it's worth trying. Thanks Paul! Looking forward to a good growing season. I am following your glog. You got a lot of great stuff happening over there. Best of luck growing this year, especially with your cool crosses! Thanks John! Like I said, this is just a start. I tried to sell my extra plants last year and I was only slightly successful. But, those that did buy from me have already reached out to me about buying again this year, so I will try to start up the same amount, around 140 different peppers, 3 each. So, more chinense on the way, maybe next week. I am currently planning on growing 10 different Scotch Bonnet varieties. That will be fun! Thanks for the heads up Andy! I will give that a try! Looking forward to the great stuff you sent me. I assume the "w strain" is the Walchit strain?? I did not know that. Thanks for the translation. It seems like Vladan over at Rainbow Chile Seeds is really into hybrids and coming up with interesting names for them. I have gotten good stuff from them in the past so I thought I would have some fun and grow a few of his super hot crosses. Should be fun to see what I get. Pierre, You always send me great ideas and I sincerely appreciate it. I will look into this and see if I can somehow make if work for my garden area! Hope all is well over by you and your grow area! 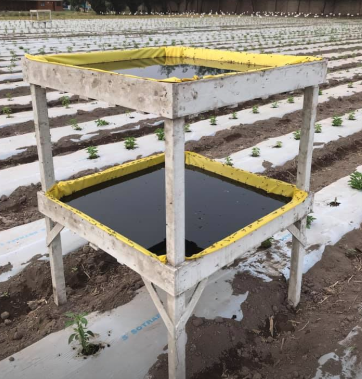 I found the idea of the trap interesting, especially that I have friends raising cows and they have molasses at 45 gallons..
Last summer I finished the leveling for the greenhouse, but i decided to let the winter get through before building it. 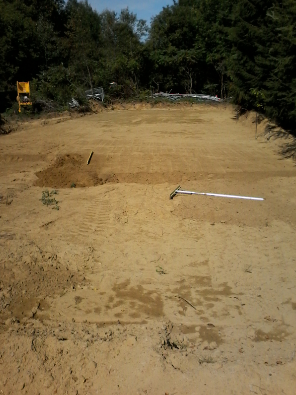 The soil will be compacted with all the fall rain and I will do a final leveling in the spring. Awesome site, Ben. Looks like a lot of room. I wish it was mine lol. Unfortunately, that is not my site. My garden is still in my small backyard. That pic is of Pierre's (Floricole) new garden area. Definitely looking forward to that glog. Just threw down some more seeds in another biodome. Edited by bpiela, 22 January 2019 - 11:58 PM. From, Maybe I'll skip a year. To, Look at this List. I think the white w strain was actually created by jay weaver, pretty sure I read that somewhere the other day. Paul, my goal is to keep one plant of each type for my garden and then sell/giveaway the rest. I still have a bunch more to start. Started another set of chinense seeds yesterday. 3 cells of each. These are seeds I got from Seed Trains and from Texas Hot Peppers. Quite the list Ben, I see you're gonna busy busy!